Red Shift (Play For Today, 1978) – John Mackenzie (BFI). A shifting sense of time, space, and place can bring huge advantages to fantastical works of fiction. The feeling that time is a folded concept, repeating and resetting in a quasi-ritualistic ceremony of life adds a sheen of the monumental to even the smallest and most intimate of dramas. This sheen is the absolute embodiment of the work of writer, Alan Garner, and is never more present than in John Mackenzie’s screen adaptation of Garner’s story, Red Shift. Broadcast in 1978 and made for the Play For Today slot, Red Shift is yet another example of high quality ruralist sci-fi from an era of creative freedom at the BBC and ITV which seems almost as fantastical to consider as the narratives of the work broadcast, especially in the context of the modern-day, pedestrian pace and broad stroke drama that dominates the main channels. 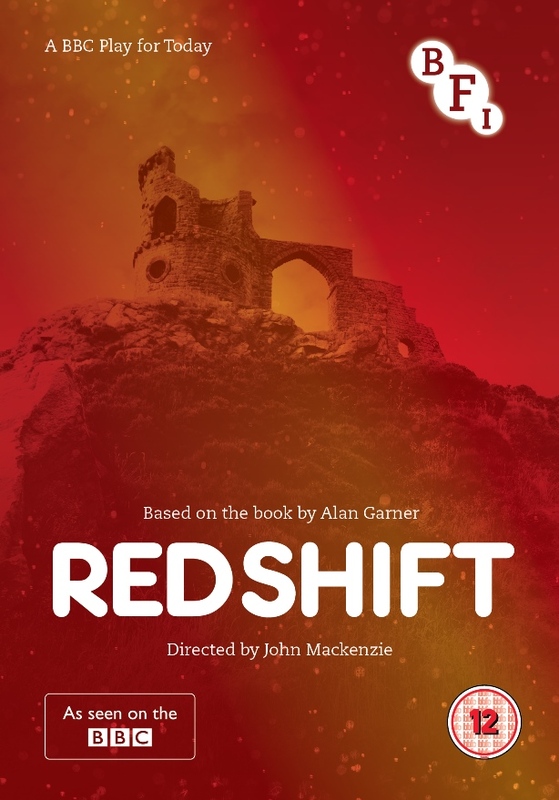 Red Shift follows three separate men in three separate timelines, connected by three aspects; a strained but reliant relationship with women, the location and landscape of Mow Cop in south Cheshire, and the finding of a talisman-like axe head that is hinted at being delivered into the ground from the stars. The play moves between the tragedies of these three timelines, gradually showing their odd connections to the point where something more ancient and possessed begins to occur. Garner is a writer that drenches his narratives in his local landscape, history, and folklore. His native Alderly Edge, only down the road from Mow Cop, lies in the weird shadow of Jodrell Bank; the sheer imagery of his own personal life lends itself well to 1970s fantasy dramas, many of which were often mixtures of ancient powers and modern technology (à la Nigel Kneale). His description of where Red Shift actually came from perhaps belies his style of storytelling with all three of the interconnected stories having basis in factual events collected over the years by Garner himself. As a director, Mackenzie does well with the complex shooting of the narrative. The cuts between different timelines (individually, Roman, English Civil War, and modern day 1970s), creates a sparse sense of space. The characters almost connect together, not just through their narratives but through their location; when one man looks to the stars, the emphasis that the others can comprehend the same cosmic patterns provides a beautifully symbolic link to a timeless landscape. This is heightened to even greater planes by the stunning monument and natural landscape of Garner’s country. 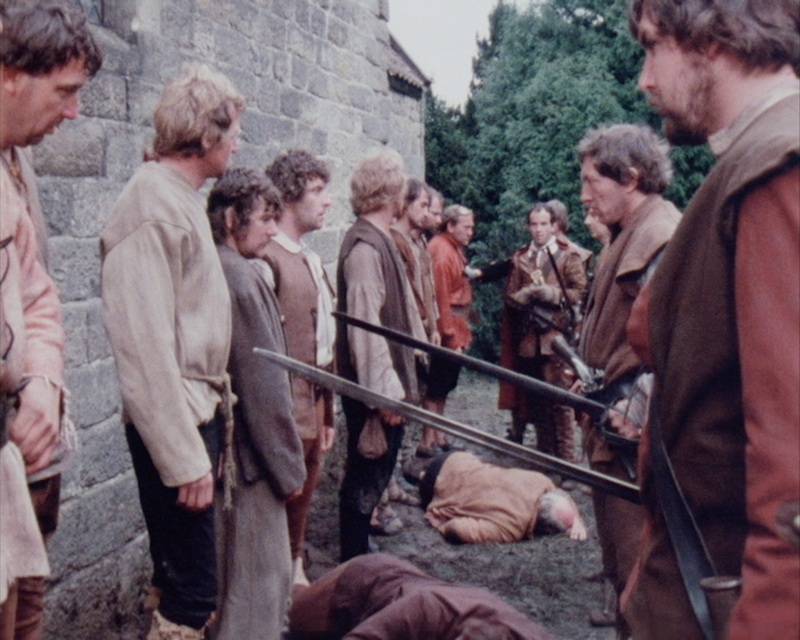 In spite of several horrific happenings (particularly an execution scene graced with such casual ease that it still haunts with its frank musket shot to the head), the overall feel of the film is one of engulfment in this landscape and its powers over the human psyche. It’s the same theme that runs through other television of the era as well. 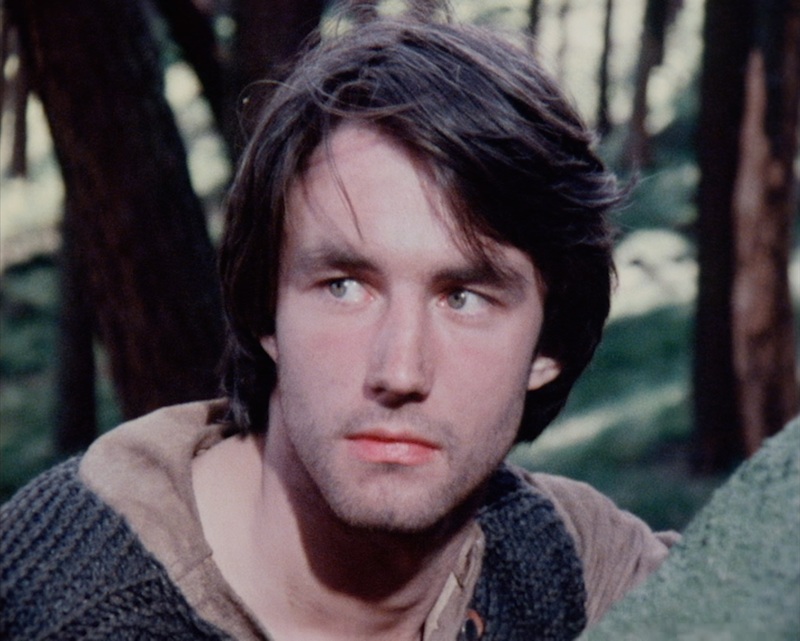 The most obvious is David Rudkin’s Penda’s Fen, directed by Alan Clarke in 1974. The relationship between the two plays is further enhanced by the direction that both directors eventually went down; evolving from fantastical phantasms of the landscape to brutal social dramas. Red Shift is, however, more encompassing of its definition of time than Clarke’s film. Far from the ambiguities of Rudkin’s drama, Garner’s is more explicit in its timeline and unafraid to display its slipping off into the past or maybe the future. When Tom (Stephen Petcher), the main character locked into the 1970s life stuck with parents in a caravan home, claims that “I need a red shift.”, he is doing so more than simply to justify Garner’s title but to build upon this sheen of time. No doubt Penda’s Fen‘s Stephen (Spencer Banks), Children of the Stones‘, Adam (Gareth Thomas), and The Owl Service‘s Alison (Gillian Hills), could all do with, or perhaps even do eventually get, a “red shift” of their own. The latter is an interesting example to pick up on, specifically because it is another Garner adaptation; another story where the past bleeds through to the present and controls destiny to mould the future. Clearly, it is a typical Garner theme and one that is very apparent when the writer discusses his work and his personal input into the stories he writes (or perhaps “projects” is a better word to describe the process of his work than simply “writes”). Even when the main couple, Tom and Jan (Lesley Dunlop), break apart, the violence that stems is more of an inner scream and a suppression of physical excursion. The sense of repression, fallout, and release builds into a never-ending cycle in Garner’s work and Red Shift in particular. The talisman axe-stone probably haunts a whole host of unsuspecting, delicate men in times that would ironically be impossible to express. Interviews with Garner suggest this tendency of timeless inner violence to be far more autobiographical than it appears, perhaps showing the sheer frustration of the intelligent writer, deeply tied to a past that not only hurt him but also made him the success that he still is today. The first thing to mention about this release is the quality restoration of the main feature. For so long, Red Shift had been one of the many superb Play For Today dramas negated to only being available on YouTube. Thanks to the excellent work of Peter Crocker (as well as Paul Vanezis), Red Shift looks spellbinding with a new cut being taken from the 16mm prints. The sound in particular is a stellar improvement on the hissy versions previously available online and Phil Ryan’s prog-style soundtrack is an absolute pleasure. Features on the release are well curated and make for an overall excellent package. A slightly dry set of interviews with 1st Assistant Director Bob Jacobs and Film Editor Oliver White is more than made up for by two shorter works. 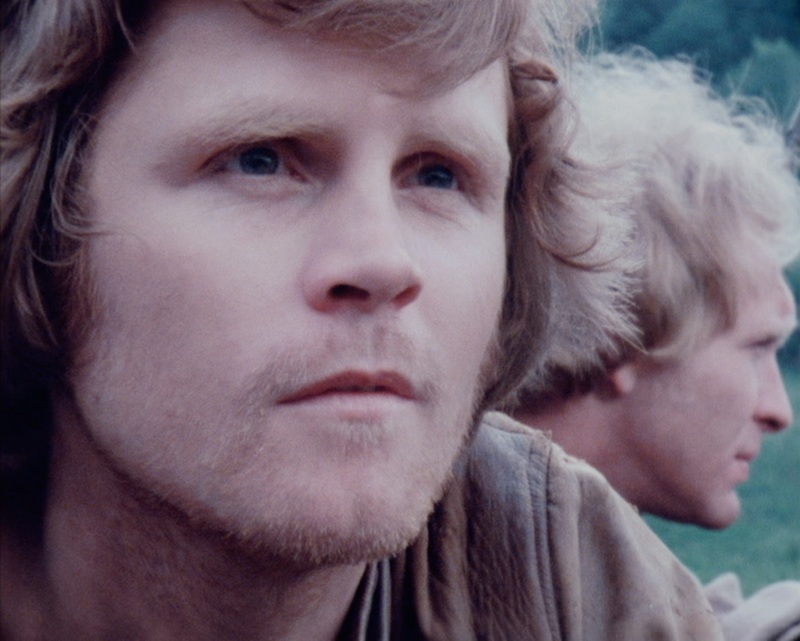 The first is an episode of One Pair of Eyes: Alan Garner – All Systems Go from 1972. The program feels more like a beautiful, art-house essay film, full of folklore and landscape, and soundtracked by Malcolm Clarke of the Radiophonic Workshop. It not only puts Red Shift completely into perspective (having been made a whole six years earlier) but it is also an essential viewing for fans of Garner. For this extra alone, the release is worth purchasing. 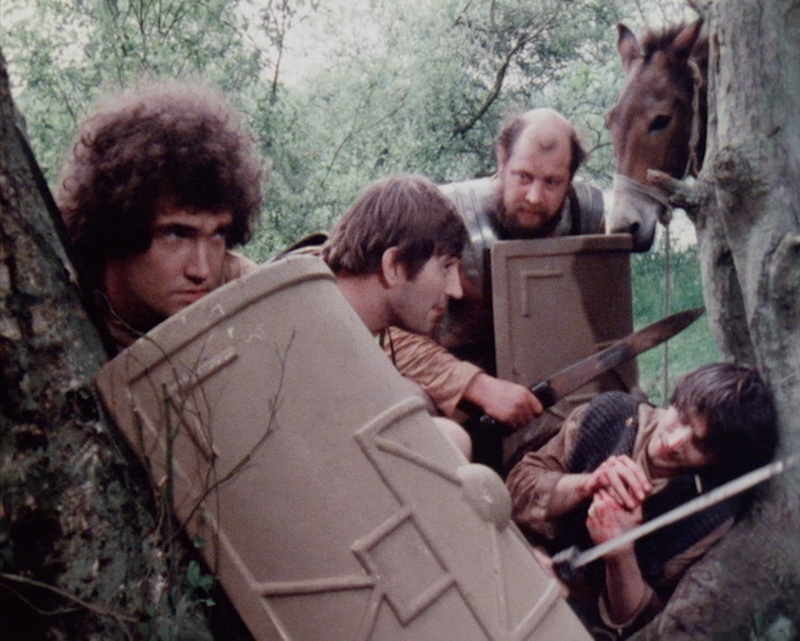 Adding to the theme of Cheshire, Kevin Marsland’s short promotional film Spirit of Cheshire (1980) is also included and is a whimsical treat. Michael Hordern voices the spirit of a Rolls Royce that drives with fellow “family members” around the stunning countryside and houses of Cheshire, including Garner’s own home-turf and other properties. It’s a quaint and enjoyable little film, adding nicely to the package’s overall sense of place; an ultimately essential aspect in understanding and drinking in Garner’s work. Red Shift is released on DVD by the BFI on the 13th of October 2014. A must have! Thanks for review. The Beast (1975) – Walerian Borowczyk (Arrow Video).